The legal drinking age is the age at which a person can legally consume alcoholic beverages. These laws cover a wide range of issues and behaviors, addressing when and where alcohol can be consumed. The minimum age alcohol can be legally consumed can be different from the age when it can be purchased in some countries. These laws vary between different countries and many laws have exemptions or special circumstances. Most laws apply only to drinking alcohol in public places with alcohol consumption in the home being mostly unregulated (an exception being the UK, which has a minimum legal age of five for supervised consumption in private places). Some countries also have different age limits for different types of alcoholic drinks. The most commonly known reason for the law behind the legal drinking age is the effect on the brain in adolescents. Since the brain is still maturing, alcohol can have a negative effect on the memory and long-term thinking. Alongside that, it can cause liver failure, and create a hormone imbalance in teens due to the constant changes and maturing of hormones during puberty. Algeria None (illegal to all persons) Illegal to sell, produce or consume alcohol at any age. Angola None (legal at any age) There is no national legislation prohibiting the sale of alcohol to minors. It is illegal to sell alcoholic beverages to anyone under the age of 18. It is also illegal for minors to buy and consume alcohol. Botswana None (illegal for any person to supply) 18 It is illegal for any person with a liquor license to sell or supply alcoholic beverages to minors under the age of 18 years. Because the law only applies to licensees, it is not illegal for minors to buy, consume, or possess alcoholic beverages. It is also illegal for any person to expose or supply alcohol to a minor under the age of 18 years. Burundi None 18, or none (if accompanied by parent or legal guardian) It is illegal for any person with a liquor license to sell or supply alcoholic beverages to unaccompanied minors under the age of 18 years. Cameroon 21, or 18 (if accompanied by a person 21 years of age or older) It is illegal for any person with a liquor license to sell or supply alcoholic beverages to anyone under 18 years of age. The law permits adults from the ages 18 to 21 to consume, purchase and buy alcoholic beverages if accompanied by a person 21 years of age or older. Anyone over the age of 21 years may buy or consume alcohol unaccompanied. Cape Verde None 18 It is illegal for any person to sell or supply alcoholic beverages to minors under the age of 18 years. Central African Republic 15 (off-premises), or 21 (on-premises) It is illegal for any person to sell or supply alcoholic beverages to minors under the age of 15 years when sold or supplied off-premises (e.g., liquor stores, wine stores, and supermarkets). It is illegal for any person to sell or supply alcoholic beverages to minors under the age of 21 years when sold or supplied on-premises (e.g., restaurants, bars, and cafes). Comoros 18 It is illegal for any person to sell or supply alcoholic beverages to minors under the age of 18 years. Eritrea None 18 It is illegal for any person to sell or serve alcoholic beverages to minors under the age of 18 years. Ethiopia None 15 It is illegal for any person to sell, offer, serve or allow to serve alcoholic beverages "in substantial quantities" to any infant or young person. The criminal code defines a young person as any person under the age of 15 years. But the Criminal Code states: "Whoever endangers the health of another, intentionally and unscrupulously, by administering or serving, or by causing or permitting to be administered or served, to minors (defined as anyone under the age of 18 years) (...) alcoholic beverages or spirituous liquors of such kind or in such quantity as to make their injurious effect certain or probable, is punishable with simple imprisonment not exceeding one year, and fine." Gabon 18 (on-premises only) It is illegal for any person to sell or supply alcoholic beverages to minors under the age of 18 years when sold or supplied on-premises (e.g., restaurants, bars, and cafes). Gambia None 17 It is illegal to sell, serve or supply alcoholic beverages to child or young person. A "young person" is defined as anyone under the age of 17 by the Children and Young Persons Act, 1949 Section 2. Kenya None 18 It is illegal to sell, serve or supply alcoholic beverages to anyone under the age of 18 years. Lesotho 18 It is illegal to sell, serve or supply any alcoholic beverage to a minor under the age of 18 years. It is also illegal for minors to consume, buy or attempt to buy alcohol. Liberia None 18 It is illegal to sell, serve or supply alcoholic beverages to anyone under the age of 18 years. Libya Illegal Previously Article 498 of the Libyan Penal Code prohibted the sale of alcoholic beverages to juveniles under the age of 16 years. Malawi None 18 It is illegal to sell, serve or supply alcoholic beverages to anyone under the age of 18 years. Mauritius None 18 It is illegal to sell, serve or supply alcoholic beverages to anyone under the age of 18 years. Namibia None 18 It is illegal to sell, serve or supply alcoholic beverages to anyone under the age of 18 years. South Africa 18 The parent, adult guardian of a minor or a person responsible for administering a religious sacrament, may on occasion supply to that minor a moderate quantity of liquor to be consumed by the minor in the presence and under the supervision of that parent, guardian or other person. 16 (wine, beer, porter, cider, perry or native liquor with meal) It is illegal for any licensee to sell, serve or supply alcoholic beverages to anyone under the age of 18 years. The law provides an exception for anyone who is 16 or 17 years of age, and consumes a fermented alcoholic drink with a meal, in a part of a licensed premises that serves meals and is not a bar. Zambia 18 It is illegal for any person with a liquor license, to sell, serve or supply alcoholic beverages to anyone under 18 years of age. Before the Liquor Licensing Act was enacted in 2011, the minimum age to sell, serve and supply alcoholic beverages was 14 years. Zimbabwe None 16 It is illegal for any person to sell, lend, give, supply, deliver or offer alcoholic beverages to any child under the age of 16 years, except upon production of a written order signed by the parent or guardian of the child known to such person. The police has the duty to seize any alcoholice beverage in the possession of a child under the age of 16 years without a written consent of the parents or legal guardian. The minimum age to purchase and consume varies, but the most common age is 18 years. However, in North America the age limits varies between 18 and 21 years of age. Throughout the United States, Puerto Rico and the Virgin Islands notwithstanding, the minimum legal age to purchase any alcoholic beverage from a shop, supermarket, liquor store, bar, club or any other licensed premises is 21 years of age. In Canada each province can decide which minimum age limit is to be set to buy or consume alcohol. Most provinces have a minimum age of 19 years, while Alberta, Manitoba and Quebec have set a minimum age of 18 years. 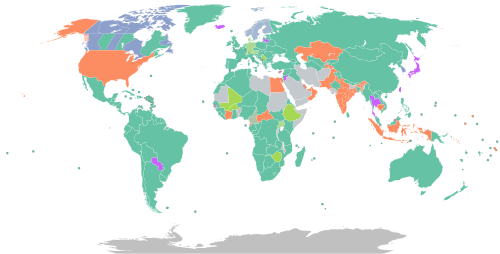 In South America all countries have set a minimum purchase age of 18 years, except for Guyana where minors aged 16 or 17 may consume a glass of beer, wine or cider in a restaurant provided they buy a meal, and Paraguay the only country with a minimum legal purchase and drinking age of 20 years. Anguilla None 18 It is illegal to sell or serve alcoholic drinks to anyone under the age of 18 years. Violating the regulation is punished with a $9.600 fine. Antigua and Barbuda None 16 The sale and distribution of alcohol to a person under 16 years of age is illegal. Bahamas 18 It is illegal for any adult to sell, serve or supply any alcoholic beverage to a child (defined as anyone under the age of 18 years). The law provides an exception to treat an illness in urgent cases or upon order by a medical doctor. Barbados None 16 It is illegal to sell or serve any alcoholic beverage to anyone under the age of 16 years. The President of the Barbados Road Safety Association is trying to raise the drinking age to 18 years because the law is often violated. Belize 18 Drinking age is rarely enforced. IDs are almost never requested. Bermuda 18 It is illegal to sell or serve any alcoholic beverage to a child under the age of 18 years. Bolivia None 18 It is illegal to sell or serve alcoholic beverages to minors under the age of 18 years. Every sold alcoholic beverage has to have a warning message on the bottle or container reading: “VENTA PROHIBIDA A MENORES DE 18 AÑOS DE EDAD” (Sale prohibited to (anyone) under 18 years of age) and “EL CONSUMO EXCESIVO DE ALCOHOL ES DAÑINO PARA LA SALUD” (Excessive alcohol consumption is harmful to (ones) health). Brazil None 18 It is illegal to sell, serve or supply any alcoholic beverage to a person under 18 years of age. The presidential law enacted on March 17, 2015 made any violation of the law a criminal offence. Any adult person selling, serving, giving or supplying alcoholic beverages to a minor is punished with imprisonment of 2 to 4 years, a fine of R$3.000 to R$10.000 and a ban to operate any business selling or serving alcohol. British Virgin Islands 16 It is illegal to sell or to supply alcohol to anyone under the age of 16. Quebec 18 In Alberta no person may give or sell or permit any person to give or sell liquor to a minor in licensed premises. In Manitoba a person must not give, sell or otherwise supply liquor to a minor. the law provides exceptions for a doctor, dentist, pharmacist or other health care professional for medical purposes; for sacramental purposes and by the parent, guardian, spouse or common-law partner, if it is given or supplied in a residence. In Quebec the law probits the sale of alcoholic beverages to a minor under the age of 18 years. Nunavut 19 Ontario's Liquor Licence Act permits the supply and consumption of liquor to those under the age of 19. However, supplying a person under the age of 19 is restricted to the person's parent, or legal guardian, and may only occur in a residence or in a private place of the parent or legal guardian. A person under the age of 19 who was supplied liquor in this manner is permitted to consume the liquor only in the place it was supplied. Cayman Islands 18 It is prohibited to sell, serve or supply alcoholic beverages to anyone under the age of 18 years. It is also illegal for any minor to buy, attempt to buy or consume alcoholic beverages. Violation of the lawis punished with a fine of five thousand dollars, and the court may, if the offence was committed by the licensee, order that the licensee shall forfeit his licence and that no licence may be issued to that person for a period not exceeding ten years from the date of his conviction. Chile 18 The minimum age is 18 to enter an enclosure that sells alcoholic beverages. Selling alcohol to a minor may incur a fine. One must provide identification upon request. Residents of Chile over the age of 18 must carry their Chilean identification card issued by the Civil Registry and Identification Service at all times. Colombia None 18 The law prohibits the sale of alcohol to a minor (anyone under the age of 18 years). It is not illegal for minors to buy, attempt to buy or consume alcohol. Costa Rica None 18 The law prohibits the sale of alcohol to a minor (anyone under the age of 18 years). Selling alcohol to a minor will be punished with a fine equivalent to ten basic salaries. Whoever permits minors to maintain in any establishment which main purpose is to sell alcoholic beverages, will be sanctioned with a fine equivalent to five salaries. It is not illegal for minors to buy, attempt to buy or consume alcohol. Cuba None 16 The penal code prohibits any adult to induce any young person under the age of 16 years, to habitually consume alcoholic beverages. However this means that de facto anyone selling, serving or supplying alcohol should check if the buyer has attained the age of 16 years. In most cases this law is not strictly enforced. Ecuador None 18 It is illegal to sell alcohol beverages to a minor under the age of 18 years of age. The law obligates establishments to place a visible notice at the point of sale and to check identification to enforce the law. However it is not illegal for minors to buy, attempt to buy or consume alcohol. El Salvador None 18 It is strictly prohibited to sell or serve alcoholic beverages to a minor under the age of 18 years. Violation of the law is punished with ¢ 25,000.00 and if convicted once more the license will be suspended for a period of six months. It is legal for minors to buy, attempt to buy and consume alcohol. Falkland Islands 18 It is illegal for any adult to sell, give or provide alcohol to a minor under the age of 18 years in any public place or licensed premises. Parents may permit their children to consume alcohol on private premises. Minors consuming alcohol in public are committing a criminal offence. The law provides exceptions for the consumption of alcohol by minors for prescription of or at the direction of a government medical officer or in the course of the administration of Holy Communion according to the rites of any Christian denomination. Grenada 18 It is illegal to sell, serve or supply any alcoholic drink to a minor under 18 years of age. Minors under 18 years are prohibited by law, to consume alcoholic beverages in public. Guatemala 18 It is illegal to sell, serve or supply any alcoholic drink to a minor under 18 years of age. Minors under 18 years are prohibited by law, to consume alcoholic beverages in public. Guyana 18/16 for beer, wine and cider with meal It is illegal to sell or serve alcohol to a person under 18 years of age. The law provides an exception for minors aged 16 and 17, if they consume a glass of beer, wine oder cider with a meal in a restaurant. Otherwise attempting to buy alcohol or buying alcohol as a minor is an offence. Haiti None 18 It is illegal to sell or serve alcohol to minors from May 17, 2017. Vendors are required to check identification. Jamaica None 18 It is illegal to sell or serve any alcoholic beverage to a child (which is defined as anyone under the age of 18 years). Mexico 18 The minimum age to buy and consume alcoholic beverages is regulated by each state of Mexico. But all states have set a minimum age of 18 years, and in no state it is illegal for minors to buy and consume alcohol. 18 (bars, clubs, markets, supermarkets, sports and recreation centers) The law from 1980 prohibits the sale of alcoholic beverages to minors under the age of 18 years. Every point of sale or establishment serving alcohol, is required to post a notice stating that the sale of alcohol to minors under 18 years of age is illegal. However the law permits children as young as 14 to purchase and consume alcohol in a restaurant without further restrictions. Trinidad and Tobago None 18 It is illegal to sell, serve or supply alcoholiv beverages to child under the age of 18 years. It is also illegal for an adult to send a child to buy alcohol on behalf. It is not illegal for children to buy or consume alcohol. Turks and Caicos Islands None 18 It is illegal to serve or sell liquor to a young person under the age of eighteen years. Minors under the age of sixteen years may not present in a licensed premises mainly serving and selling alcoholic beverages. (50 states and integral territories) Varies by jurisdiction 21 The National Minimum Drinking Age Act of 1984 withholds revenue from states that allow the purchase of alcohol by anyone under the age of 21. Prior to the effective date of that Act, the drinking age varied from state to state. Some states do not allow those under the legal drinking age to be present in liquor stores or in bars (usually, the difference between a bar and a restaurant is that food is served only in the latter). Contrary to popular belief, since the act went into law, only a few states prohibit minors and young adults from consuming alcohol in private settings. As of January 1, 2010, 15 states and the District of Columbia ban underage consumption outright, 17 states do not ban underage consumption, and the remaining 18 states have family member or location exceptions to their underage consumption laws. Federal law explicitly provides for religious exceptions. As of 2005, 31 states have family member or location exceptions to their underage possession laws. However, non-alcoholic beer in many (but not all) states, such as Idaho, Texas, and Maryland, is considered legal for those under the age of 21. By a judge's ruling, South Carolina appears to allow the possession and consumption of alcohol by adults 18 to 20 years of age, but a circuit court judge has said otherwise. The states of Washington and Wisconsin allows the consumption of alcohol in the presence of parents. Some U.S. states have legislation that make providing to and possession of alcohol by persons under twenty-one a gross misdemeanor with a potential penalty of a $5,000 fine or up to a year in jail. Uruguay None 18 Only selling alcohol to minors under the age of 18 is prohibited, consumption and purchase by minors is not illegal. Venezuela None 18 Only selling alcohol to minors under the age of 18 is prohibited, consumption and purchase by minors is not illegal. Bahrain No legally-determined drinking age. Bangladesh (Illegal for Muslims.) Alcohol will be sold to foreigners in certain locations, albeit clandestinely. Brunei 17 with restrictions, unless Muslim Non-Muslims over 17 years of age are allowed to import alcohol not to exceed maximum total volume 2 liters of liquor and 12 cans of beer at 330 ml for personal use, once in 48 hours. This alcohol must be “stored and consumed at the place of residence of the importer” and is “not to be given, transferred or sold to another person.”. China 18 Introduced in January 2006,but not enforced to practice. Hong Kong 18 IDs are rarely checked in bars and clubs, but are checked when purchasing alcohol at shops. Private drinking is also not regulated. Consumption of alcohol is illegal in the states of Bihar, Gujarat and Nagaland. Iran Illegal There is a ban on alcohol, but religious minorities may purchase small amounts from shops owned by the same religious minority. Israel None 18 Israel law prohibits selling or serving alcohol to minors, but it does not prohibit minors to drink, although the police may confiscate alcoholic drinks consumed by minors in public. Lebanon 18 / None Often unenforced and according to a global school health study, 40% of minors over 13 drink alcohol and up to 25% buy it from stores. Malaysia 21 Increased from 18 to 21 in December 2017, but was not into effect until October 16, 2018. There will be an 18-month grace period for sellers to comply with this new law. After the grace period, anyone caught selling to persons under 21 can be fined up to RM10,000 and jailed up to 2 years. .
Nepal 18 The legal age for consumption of alcohol in Nepal is 18. However, there are exceptions to underage consumption for purposes of religious ceremonies. Oman 21 Residents need personal liquor licenses to consume alcohol in their private residences. Palestinian Authority 16 Legal in most cities. Qatar Illegal Muslims are allowed to purchase alcohol, but generally not allowed to consume. Non Muslims are allowed to purchase, and consume alcohol. The only legal distributor of alcohol in the country is the Qatar Distribution Company located in Doha. Saudi Arabia Illegal Drinking or possessing alcohol is illegal in the Kingdom of Saudi Arabia. Persons who drink or possess alcohol are subject to arrest and trial. Punishments range from heavy fines, lengthy prison terms and whippings. 18 (public places e.g. bars and restaurants) 18 It is an offense to sell alcohol to minors. Anyone caught selling or furnishing alcohol in any licensed premise to persons below 18 can be fined up to $5000. It is also illegal for minors to purchase, or attempt to purchase alcohol from any licensed premises, in which the minors can also be fined up to $5000. However, the authorities rarely enforced this on minors. It is technically legal for minors to possess and consume alcohol at home and in public (not in any licensed premises) as there is no law prohibiting it. It is also technically legal for someone to purchase alcohol and pass it to minors outside the store or licensed premise. South Korea None 19 The age limit for alcohol is after January 1 of the year one's age turns to 19. It is illegal for anyone under the age of 18 to consume alcohol. Parents, guardians, and others taking care of people under 18 shall prohibit underage drinking, or risk administrative fines of 10000 to 50000 new Taiwan dollars when the situations are serious. One shall not supply alcohol to anyone under the age of 18. A violator shall be administratively fined 3000 to 15000 New Taiwan Dollars. Thailand 20 The Alcoholic Beverage Control Act of 2008 increased the drinking age in Thailand from 18 to 20, private drinking is not regulated in private locations. United Arab Emirates 18–21 (varies by jurisdiction) Expatriate non-Muslim residents may request a liquor permit to purchase alcoholic beverages, but it is illegal for such holders to provide drinks to others. The legal age for drinking alcohol is 18 in Abu Dhabi (although a Ministry of Tourism by-law allows hotels to serve alcohol only to those over 21), and 21 in Dubai and the Northern Emirates (except Sharjah, where drinking alcohol is illegal). It is a punishable offence to drink, or to be under the influence of alcohol, in public. In 2002 the autonomous communities Madrid, Valencia and Catalonia raised their minimum purchase age to 18 years. Previous to 2002 Valencia and Madrid had a minimum purchase age of 16 years, and in Catalonia minors aged 16 or 17 could purchase alcohol up to 23% ABV on and off premises. In 2004 Denmark raised its off premises purchase age from 15 to 16 years. In November 2005 Switzerland passed its "Food and Commodities Regulation" (German: Lebensmittel- und Gebrauchsgegenständeverordnung), introducing a ban on alcohol sales to anyone under the age of 16, even though "Alcohol Law" (German: Alkoholgesetz) passed in 1980 already required a minimum age of 18 years for the retail sale of distilled spirits. Therefore, it is illegal to sell fermented alcohol (e.g. beer, wine, sparkling wine or cider) to anyone under the age of 16, and any distilled alcoholic beverages to anyone under the age of 18 years. Further the canton of Ticino introduced a cantonal law in 1989 banning all alcohol sales to anyone under the age of 18 years. In 2006 the autonomous community Castile and León raised its minimum purchase age from 16 to 18 years. In late 2006, Gibraltar lawmakers passed the "Children and Young Persons (Alcohol, Tobacco and Gaming) Act 2006", which raised the minimum purchase age from 16 to 18 years. But the new law made an exception: minors aged 16 or 17 can purchase and consume on premises beer, wine or cider under 15% ABV or pre-packed containers of an alcoholic strength not exceeding 5.5% ABV (e.g. alcopops). In 2009 France raised its minimum purchase age to 18 years, and fines were increased for selling or serving alcohol to a minor (up to 7,500 €). Previous to 2009 the minimum age to purchase any alcohol from off licensed premises was 16 years. In order to purchase alcohol on premises the minimum age was 16 years for low alcoholic beverages such as wine, beer, cider, perry, mead, crème de cassis and juices from fermented fruits or vegetables that contain 1.2 to 3° alcohol, natural sweet wines from controlled cultivation – to purchase or be served stronger alcoholic drinks one had to be 18 years of age. In October 2009, the government of Malta passed a new law raising its drinking and purchase age from 16 to 17 years. In 2010 the autonomous community of Galicia raised its minimum purchase age from 16 to 18 years. In 2011 Denmark passed a new law, raising the minimum age for off-premises sale of alcohol >16.5% ABV to 18 years of age. The age to purchase alcohol <16.5% ABV remaines at 16. Italy raised its minimum purchase age from 16 to 18 in 2012. Previously Italy did not have a purchase age for off-premises sales, and the minimum age of 16 years for on premises sales was barely enforced. In 2013 the government of Portugal restricted alcohol sales to young people: distilled spirits can not be sold to anyone under the age of 18, and other alcohol (e.g. beer, wine or cider) can't be sold to anyone under the age of 16. Previously the minimum age for all kinds of alcoholic beverages was 16 years. As of 1 January 2014, the minimum legal purchase and consumption age was raised from 16 to 18 in the Netherlands. Previously young people over the age of 16 could purchase and consume alcohol <15% ABV, and adults aged 18 and over could purchase alcohol over 15% ABV. As of March 2015, the autonomous community of Asturias raised its drinking age from 16 to 18 years. Asturias was Spain's last community with a drinking age of 16 years. The new law brings the drinking age into line with the rest of Spain. As of 1 January 2018, Lithuania raised its minimum drinking age from 18 to 20 years. 18 (distilled beverages) Carinthia also requires adolescents to maintain a blood alcohol level below 0.05%. Azerbaijan None 18 It is illegal to sell or serve alcohol to a minor under 18 years of age. Belarus None 18 The law prohibits the sale of alcohol to anyone under the age of 18 years. However, the law is rarely enforced. 18 (spirits) Since 10 January 2010, it is illegal to "sell, serve, or offer" any form of distilled alcohol to those under the age of 18 or any alcoholic drink to those under 16. So fermented drinks like beer or wine are permitted above 16. Previously, it was illegal to sell alcoholic drinks to under-16s, but accompanying adults could buy drinks for them. Bosnia and Herzegovina None 18 Selling alcohol to a minor under the age of 18 years is an offence. The law does not prohibit minors from buying, attempting to buy or consuming alcohol. Bulgaria None 18 By law, it is illegal to serve or sell alcohol to any child under the age of 18. There is no restrictions for minors consuming alcohol. Croatia None 18 It is prohibited to sell or serve alcohol to anyone under 18 years of age. There is no minimum age to buy or consume alcohol by law. Cyprus None 17 It is illegal to sell or serve alcohol to anyone under the age of 17 years. There is no minimum age to buy, attempt to buy or consume alcohol in public. Czech Republic None 18 It is illegal to provide alcohol to minors (punishable by fine or up to 1 or 2 year(s) imprisonment). Consumption itself is not prohibited by law. In order to buy alcohol above 1.2% and below 16.5% ABV in stores, one must be 16 years of age. In order to buy alcohol above 16.5% ABV in stores, one must be 18 years of age. By tradition, youths are privately allowed to drink alcohol after their confirmation. If a shop or bar fails to ask for an ID card and is identified having sold alcohol to an underage, it is subject to fine. A national ID card, obtained in the local town hall, can serve as age verification. This card is rarely used though since a passport or drivers license is more commonly used. Both the legal drinking and purchasing age in the Faroe Islands is 18. Estonia 18 It is illegal to sell, serve or supply alcoholic beverages to anyone under the age of 18 years. Alcohol found in possession of any child can be confiscated by the police. 18 (for all in bars, clubs and restaurants) All major grocery chains have implemented a policy to ask for ID if the customer looks under 30. Stores may refuse to sell alcohol if the customer is accompanied by a minor, or if proxy purchasing is suspected. Purchasing alcohol on behalf of a minor is a criminal offence. Police may search minors in public places and confiscate or destroy any alcoholic beverages in their possession. Incidents are reported to the legal guardian and social authorities, who may intervene with child welfare procedures. In addition, those aged 15 or above are subject to a fine. In private, offering alcohol to a minor is considered a criminal offence if it results in drunkenness and the act can be deemed reprehensible as a whole, considering the minor's age, degree of maturity and other circumstances. France None 18 France has no explicitly stated consumption age, but selling alcohol to a minor (under 18) is illegal and can be fined 7500 euros. This age was raised from 16 to 18 in 2009. Georgia None 18 By Georgian law, the sale of alcoholic beverages to anyone under the age of 18 years is prohibited. 18 (spirits and aliments containing spirits above negligible amounts) It is illegal to sell, serve or supply fermented alcoholic beverages (beer, wine, cider and sparkling wine) to anyone under 16 years of age. However this age limit drops down to 14 if a minor is accompanied by his parent or legal guardian. It is generally illegal to serve, sell or supply any beverage containing spirits and aliments containing spirits above negligible amounts, to anyone under the age of 18 years. Violation of the "Protection of Young Persons Act" can be fined up to €50.000. The alcoholic beverage is served in a bottle, or a pre-packaged container below 5.5% ABV. Greece None 18 In 2008, the consumption of alcoholic beverages was prohibited for minors in public. However, the law does not apply to private events or private premises. Iceland None 20 Possession or consumption of alcohol by minors is not an offence, but supplying them with alcohol is. Ireland None (on private residence with permission from parents or guardians) 18 It is illegal for minors to buy alcohol or for a third party to attempt to buy it for minors. It is illegal to purchase alcohol for anybody under the age of consent without permission from their guardians. Italy None 18 In 2012 the then Health Minister Renato Balduzzi proposed to raise the age to 18. Selling alcohol to those under the age of 18 in shops carries a fine between €250 and €1000. Serving alcoholic beverages to those under the age of 16 is a criminal offense and is punished with prison up to one year, if the individual is 16 or 17 it will be treated as an offense that is fined between €250 and €1000 (Legge n. 189/2013). Latvia None 18 It is illegal to sell or serve alcoholic beverages to any minor under the age of 18 years. There is no minimum age to consume or possess alcohol. 18 spirits and spirit-based beverages Wine, beer and ciders as well as some other party drinks sometimes without spirits may be purchased by the age of 16. Spirits as well as alcopops may be sold only to people at least 18. Lithuania 20 It is illegal to sell, serve or supply alcoholic beverages to anyone under the age of 20 years. People under the age of 20 are prohibited from consuming alcoholic beverages or from possessing them. The minimum age was raised from 18 to 20 in 2018. Luxembourg None 16 It is illegal to sell or serve alcoholic beverages >1.2% ABV to any person under the age of 16 years. Violation is fined €251 to €1.000. Malta 17 Must provide identification upon request. Moldova None 18 It is illegal to sell, or serve alcoholic beverages to anyone under the age of 18 years. It is not illegal for minors to buy, attempt to buy or consume alcohol. The minimum purchase age was raised from 16 to 18 in 2012. Netherlands 18 The legal age for purchasing and consumption of alcoholic beverages was raised from 16 to 18 since 2014. Alcohol is commonly available upon parental permission. Selling alcoholic beverages to people under 18 is illegal, buying alcoholic beverages for someone else under the age of 18 is also illegal. North Macedonia 18 Must show an ID card upon request. In certain smaller places, such as family-owned convenience stores and street kiosks, there is little to no enforcement on how old or young somebody purchases alcohol. There is little to no enforcement for drinking privately, but drinking in bars may require an ID. 20 (≥22% ABV) Selling alcohol to or buying alcohol for minors is illegal. Minors are defined as under 18 for beer and wine, under 20 for drinks that contain 22% ABV or more. Minors who buy alcohol are not held criminally responsible; instead, the crime lies with those who sold it or obtained it for them. Alcohol with more than 60% ABV is generally not sold in Norway, although exceptions may be made by the government for specific products. Alcohol possessed by minors may be confiscated as evidence. Drinking in public is prohibited, though this is rarely enforced in recreational areas. Poland None 18 Article 15 of The Act on Upbringing in Sobriety and Counteracting Alcoholism clearly states that buyers or persons being served must be at least 18 and prove it with ID if they look like they may not be at least that age. There is no mention of consumption age in this or any other act in Poland. Drinking in public places, with the exception of designated drinking zones, is illegal regardless of age. Romania None 18 According to law 61/1991 updated in 2008, paragraphs 21-25, it is illegal to serve or sell alcohol to minors. Russia None 18 There is no law or regulation in Russia that prohibits minors from consuming alcohol, but selling alcohol to minors is prohibited by federal and additional regional laws. Slovenia None 18 There is no law regulating the possession and consumption, but it is illegal to sell or offer alcohol of any kind to minors. Spain 18 Asturias was the last autonomous community in Spain where the drinking age was increased to 18 (previously 16) on 1 May 2015. It is legal for anyone at any age to drink, but it is illegal to supply anyone under the age of 20, any beverage containing more than 3.5%ABV, and supply anyone under the age of 18 beer containing more than 2.25%ABV, except in a venue licensed to sell alcohol, who are allowed to sell alcohol to anyone over 18. It is also legal to serve an underage person alcohol in a private place, provided it's a limited amount and done in moderation. The reason for lower limit in bars than in Systembolaget shops is that bartenders have a legal responsibility for how drunk a guest gets. 18 (spirits) Whoever offers or supplies alcoholic beverages to a child under the age of 16 years in an amount which is harmful to one's health is punished with imprisonment up to 3 years or a fine. Whoever sells or supplies spirits to a person under the age of 18 years is punished with a fine up to 10.000 CHF. Ticino 18 Canton Ticino prohibits the selling of any type of alcohol to minors under the age of 18. Minors aged 16 or 17 may consume wine, beer or cider on licensed premises when ordered with a meal, and accompanied by an adult. It is legal to sell liqueur confectionery to someone of any age. It is illegal to permit minors under the age of 5 to consume alcoholic beverages unless under medical supervision or in an emergency. People over 17 are entitled to their own duty-free allowance, which includes alcohol. It is illegal to sell, serve, offer or consume alcoholic beverages in public under the age of 18. It is illegal to sell liqueur confectionery to anyone under 18, however, consumption is permitted. People over 17 and over are entitled to their own duty-free allowance, which includes alcohol. United Kingdom Challenge 21 and Challenge 25 (applies to all of the United Kingdom) Under the BBPA's Challenge 21 and Challenge 25 schemes, customers attempting to buy alcoholic beverages are asked to prove their age if in the retailer's opinion they look under 21 (or optionally 25) even though the law states they must be a minimum of 18. Many supermarket and off-licence chains display Challenge 21 (or Challenge 25) notices stating that they will not serve people who look under 21 (or 25) without ID. Varies by state. Some states restrict possession and consumption to over 18, all states restrict purchasing to over 18. In some states, minors may consume alcohol in a private residence with parental permission. Fiji 18 The drinking age was 21 from 2006 to 2009 but was lowered to 18 in 2009. New Zealand None 18 Minimum age applies for beverages with 1.15% ABV or over; no restrictions on beverages less than 1.15% ABV. Persons under 18 may drink outside private residences or private functions if accompanied by their parent or legal guardian. Alcohol may be supplied to minors only by, or with express consent from, their parent or legal guardian. Palau 21 It is illegal to sell or serve any alcoholic beverage to a person under 21 years of age. Minors may access a bar or licensed premises only if accompanied by a parent or legal guardian. Minors buying, consuming or attempting to buy alcohol are committing an offence. The law provides an exception for the consumption of alcohol by minors as part of a religiously recognized ceremony. Papua New Guinea 18 It is illegal for a minor to purchase, consume or attempt to purchase alcoholic beverages. Any licence holder has to ensure that the customer who he sells or serves alcohol to, is at least 18 years of age. Violation of this law is fined. Samoa 21 Selling or serving alcohol to a person under the age of twenty-one years is punished with three hundred dollars or imprisonment for nine months or both, a fine and imprisonment. Solomon Islands None 21 Selling or serving alcohol to a person under the age of twenty-one years old is punished with a three hundred dollar fine or imprisonment for nine months or both, a fine and imprisonment. Tonga 18 Selling, serving or supplying alcohol to a minor is illegal. It is also illegal for minors to buy, attempt to buy or consume alcohol in any public place and any violation of this law is fined up to $1,000. Vanuatu 18 It is unlawful to sell, serve or supply alcohol to any person under the age of 18 years. Violation of the law is fined up to VT 25,000 or by a term of imprisonment not exceeding 3 months, or by both, fine and imprisonment. Any minor under the age of 18 years, being found in possession or consumption of alcohol is fined up to VT 10,000. ^ "Underage Drinking". National Institute on Alcohol Abuse and Alcoholism. January 2006. Retrieved 13 May 2018. ^ a b c d e f g h i j k l m n o p q r s t u "PROTECTION FROM DRUG ABUSE/ MINIMUM AGE FOR SALE OF ALCOHOL AND DRUGS: INTERNATIONAL AND REGIONAL LAWS" (PDF). The African Child Policy Forum. Retrieved 12 March 2018. ^ a b "Sobre o acesso de menores a espectáculos nocturnos, e o consumo e a comercialização de bebidas alcoólicas por menores". Governo Provincial de Luanda. Retrieved 12 March 2018. ^ a b c "Liquor Act 2008 - Section 32" (PDF). Government of Botswana. Retrieved 12 March 2018. ^ a b "Code Pénal du Burundi - Article 501 et 502" (PDF). MINISTRE DE LA JUSTICE ET GARDE. Retrieved 12 March 2018. ^ "Law No. 2016/007 of July 12, 2016, relating to the Penal Code - Section 348". Retrieved 12 March 2018. ^ a b "Lei n.° 27/V/97". Imprensa Nacional de Cabo Verde. Retrieved 12 March 2018. ^ a b "WHO Global Alcohol Report Central African Republic" (PDF). World Health Organization. 2014. Retrieved 18 October 2018. ^ a b "WHO Global Alcohol Report Comoros" (PDF). World Health Organization. 2014. Retrieved 18 October 2018. ^ "WHO Global Alcohol Reportal Equatorial Guinea" (PDF). World Health Organization. 2014. Retrieved 18 October 2018. ^ a b "Penal Code of Eritrea - Article 267" (PDF). United Nations Office on Drugs and Crimes. Retrieved 12 March 2018. ^ a b "Criminal Code, 2004 - Article 531 & 818" (PDF). WIPO. Retrieved 12 March 2018. ^ a b "WHO Global Alcohol Report" (PDF). World Health Organization. 2014. Retrieved 18 October 2018. ^ a b "Drug Control Decree and Decree No. 80 of 1996". UN Committee on the Rights of the Child (CRC). Retrieved 12 March 2018. ^ "LIQUOR LICENSING ACT - 1970 (ACT 331) - Section 15 - Young Persons to be Excluded". Ghana Legal. Retrieved 12 March 2018. ^ a b "ALCOHOLIC DRINKS CONTROL ACT - SECTION 28" (PDF). National Council for Law Reporting. Retrieved 12 March 2018. ^ "LIQUOR LICENSING ACT 1998 - Section 39". Ministry of Tourism Environment and Culture. Retrieved 12 March 2018. ^ "Penal Code - Article (21) of Law No. (89) of 1974 prohibiting alcohol and establish the hudud punishment for drinking". Geneva Centre for the Democratic Control of Armed Forces. Retrieved 12 March 2018. ^ "Liquor Act -Section 74" (PDF). The African Child Information Hub. Retrieved 12 March 2018. ^ "Child Protection Act, 1995 Section 16" (PDF). Office of the Director of Public Prosecutions. Retrieved 12 March 2018. ^ "Sanções duras para infractores do novo regulamento". Domingo. Retrieved 12 March 2018. ^ "Liquor Act 6 of 1998" (PDF). Legal Assistance Centre. Retrieved 12 March 2018. ^ "LOI N° 4-2010 DU 14 JUIN 2010 Article 123" (PDF). UNICEF. Retrieved 12 March 2018. ^ "N° 3097/MINT/DAGAT/DEL/DB" (PDF). REPUBLIQUE DU SENEGAL MINISTRE DE L’INTERIEUR. Retrieved 12 March 2018. ^ "Alcohol - Somalia" (PDF). WHO. Retrieved 29 November 2014. ^ Department of Trade & Industry (26 April 2004). "The National Liquor Act, 59 of 2003" (PDF). Government Gazette. 446 (26294). Retrieved 2013-01-08. ^ "Sudan: Country Specific Information". U.S. Department of State. Archived from the original on 2014-01-11. ^ "Law of the Child Act 2009 - Section 17" (PDF). Tanzania Ministry of Health, Community Development, Gender, Elderly and Children. Retrieved 12 March 2018. ^ a b "Liquor Act 1960 - Section 19". Uganda Legal Information Institute. Retrieved 12 March 2018. ^ "THE LIQUOR LICENSING ACT, 2011 - Section 36" (PDF). Government of Zambia. Retrieved 12 March 2018. ^ a b "CHILDREN'S ACT - Section 78" (PDF). International Labour Organisation. Retrieved 12 March 2018. ^ a b c d "L075-00-Liquor Licences Act - 27". Government of Anguilla. Retrieved 18 March 2018. ^ "THE LICENSING (INTOXICATING LIQUOR) ACT - CHAPTER 249 - PART V - 24" (PDF). laws.gov.ag. Retrieved 2015-01-09. ^ "Ley Nacional De Lucha Contra El Alcoholismo" (in Spanish). 31 March 1997. Retrieved 2013-01-08. ^ "CHILD PROTECTION ACT - PART VI - CARE AND PROTECTION OF CHILDREN SUPERVISION ORDERS - 62. (4)" (PDF). Government of the Bahamas. Retrieved 18 March 2018. ^ a b "RAISE DRINKING AGE". BARBADOS ADVOCATE. Retrieved 18 March 2018. ^ a b "Liquor Licences Act (Cap. 106) - PART IV - 34: Sale of intoxicating liquor to children" (PDF). ird.gov.vg. Archived from the original (PDF) on 2015-01-03. Retrieved 2015-01-09. ^ "LIQUOR LICENCE ACT 1974 - Procuring drink for drunken person or minor 42" (PDF). cada.bm. Retrieved 2015-01-09. ^ a b "LEI Nº 13.106, DE 17 DE MARÇO DE 2015. Art. 1o, Art. 2o". Presidência da República Casa Civil. Retrieved 18 March 2018. ^ a b "GAMING AND LIQUOR ACT - Supplying liquor to minor - 75" (PDF). Alberta Queen’s Printer. Retrieved 18 March 2018. ^ a b "The Liquor and Gaming Control Act - No providing liquor to minors - 62 (1) and (2)". Manitoba Queen’s Printer. Retrieved 18 March 2018. ^ a b "ACT RESPECTING LIQUOR PERMITS". Gouvernement du Québec. Retrieved 18 March 2018. ^ "Liquor Licence Act, R.S.O. 1990, c. L.19 s.30 Rules, persons under 19". Queen's Printer for Ontario. Retrieved 16 October 2018. ^ "LIQUOR LICENSING LAW - 21., 22" (PDF). gov.ky. Archived from the original (PDF) on 2015-09-12. Retrieved 2015-01-09. ^ a b c d e f g h i j k l m n o p q r s t u v w x y z aa "Minimum Legal Age Limits". IARD. Retrieved 15 June 2016. ^ "LAW ON EXPENDITURE AND CONSUMPTION OF ALCOHOLIC BEVERAGES" (in Spanish). Retrieved 7 September 2017. ^ a b "LEY 124 DE 1994 - Artículo 1º". Secretaría Jurídica Distrital de la Alcaldía Mayor de Bogotá D.C. Retrieved 18 March 2018. ^ a b "Ley n.º 7633 - REGULACIÓN DE HORARIOS DE FUNCIONAMIENTO EN EXPENDIOS DE BEBIDAS ALCOHÓLICAS - ARTÍCULO 5.-" (PDF). Secretaría Jurídica Distrital de la Alcaldía Mayor de Bogotá D.C. Retrieved 18 March 2018. ^ a b "CODIGO PENAL - ARTICULO 313.1.-". gacetaoficial.gob.cu. Retrieved 18 March 2018. ^ "Tragos amargos". CUBAHORA. Retrieved 18 March 2018. ^ "Alcohol y menores de edad". cnd.com.do. Retrieved 2015-01-09. ^ a b "REGLAMENTO GENERAL A LA LEY ORGANICA DE DEFENSA DEL CONSUMIDOR PUBLICADA EN EL SUPLEMENTO DEL REGISTRO OFICIAL No. 116 DEL 10 DE JULIO DEL 2000. - Art. 54.- b)" (PDF). Secretario General de la Administración Pública. Retrieved 18 March 2018. ^ a b "LEY REGULADORA DE LA PRODUCCION Y COMERCIALIZACION DEL ALCOHOL Y DE LAS BEBIDAS ALCOHOLICAS - Art. 49.-" (PDF). Gobierno de San Salvador. Retrieved 18 March 2018. ^ a b "Control of Drinking by Juveniles Ordinance 1993 - Sections 3, 4 and 5". Government of the Falkland Islands. Retrieved 18 March 2018. ^ a b "Ordenanza reguladora de determinadas actividades de ocio en el término municipal de Granada". Ayuntamiento de Granada. Retrieved 2015-01-09. ^ a b "DECRETO NUMERO 90-97 - ARTICULO 50" (PDF). EL CONGRESO DE LA REPUBLICA DE GUATEMALA. Retrieved 2015-01-09. ^ a b "Intoxicating Liquor Licensing Act - Section 55" (PDF). EL CONGRESO DE LA REPUBLICA DE GUATEMALA. Retrieved 2015-01-09. ^ "HAITI: Interdiction de vendre de l'alcool aux mineurs informe le chef du parquet". Anmwe News. Retrieved 2015-01-09. ^ a b "Child Care and Protection Act - Section 40" (PDF). Government of Jamaica. Retrieved 2015-01-09. ^ a b "PROHIBICIÓN VENTA DE LICOR A MENORES DE DIECIOCHO AÑOS - Artículo 1.-". Asamblea Nacional de la República de Nicaragua. Retrieved 2015-01-09. ^ "EL CONSFJO NACIONAL DE LEGISLACION DECRETA: CAPITULO PRIMERO IMPUESTOS SOBRE EXPENDIO DE BEBIDAS ALCOHOLICAS" (PDF). Consejo Nacional de Legislación. Retrieved 2015-01-09. ^ "Ley N° 1.642 / 2000 - QUE PROHÍBE LA VENTA DEBEBIDAS ALCOHÓLICAS A MENORES DE EDAD Y PROHÍBE SU CONSUMO EN LA VÍA PÚBLICA". portalguarani.com. Retrieved 2015-01-09. ^ "Ley No. 28681" (PDF). docs.peru.justia.com. Retrieved 2015-01-09. ^ "S a i n t Vi n c e n t a n d t h e G r e n a d i n e s" (PDF). ^ a b "Liquor Licenses Act - Section 60" (PDF). Retrieved 2015-01-09. ^ a b "Liquor Licenses Act - Section 27". Retrieved 2015-01-09. ^ "Judge: State law barring underage drinking is unconstitutional". 14 July 2009. Retrieved 28 July 2015. ^ Washington State Legislature. "RCW 66.44.270; Furnishing liquor to minors". State of Washington. Retrieved 2013-01-08. ^ "Helpful Visitor Information for the Virgin Islands". Vinow.com. Retrieved 2012-08-11. ^ "Legisladores quieren prohibir que menores de 18 consuman bebidas alcohólicas". Retrieved 2015-01-09. ^ a b "REGLAMENTO DE LA LEY N° 28681, LEY QUE REGULA LA COMERCIALIZACIÓN, CONSUMO Y PUBLICIDAD DE BEBIDAS ALCOHÓLICAS - Artículo 14°" (PDF). Retrieved 2015-01-09. ^ Institute for War and Peace Reporting (2009-06-17). "Drinkers Dismissive of Latest Alcohol Ban". ARR No. 322. Retrieved 2010-02-28. ^ Behnke, Jason (July 27, 2018). "Military raises drinking age for DOD personnel in Bahrain from 18 to 21". Stars and Stripes. “However, based upon a recent review and research concerning this issue, it was determined that Bahraini law does not establish a drinking age,” she said. ^ "Bangladesh" (PDF). Global Status Report on Alcohol 2004. World Health Organization. 2004. Retrieved 2009-03-28. ^ "Rules And Regulations For Establishment And Operation Of Industrial And Commercial Ventures In Bhutan, 1995" (PDF). Retrieved 2015-04-29. ^ "Global Status Report: Alcohol Policy, Cambodia" (PDF). Retrieved 2009-06-20. ^ China bans under-age drinking, China Daily, 2006-01-06. Retrieved 2008-02-03. ^ Regulation of underage drinking, Legislative Council, 2017-04-24. ^ "States with total and phase-wise prohibition of alcohol in India". 6 April 2016. Retrieved 25 April 2016. ^ "Tak Boleh Minum Bir Sebelum Umur 21 Tahun". CNN Indonesia. Retrieved 2017-09-05. ^ "Iraq's parliament passes law banning alcohol". 2016-10-23. Retrieved 2018-05-05. ^ "Global Status Report: Alcohol Policy, Jordan" (PDF). Retrieved 2009-06-20. ^ "Kazakhstan to ban public smoking & raise drinking age, KazakhstanLive" (PDF). Retrieved 2011-01-30. ^ Who Are The Abstainers? (PDF). International Center for Alcohol Policies. June 2000. Archived from the original (PDF) on 2006-09-30. ^ "Lebanon's underage drinking problem - Executive Magazine". Executive Magazine. 2013-03-14. Retrieved 2016-06-19. ^ "What's the Legal Drinking Age in Asia - TripSavvy". TripSavvy. 2017-12-20. Retrieved 2018-05-21. ^ Boo Su-Lyn (28 May 2016). "Putrajaya raises legal drinking age, imposes health warnings". Malay Mail Online. Retrieved 7 June 2016. ^ "Alcohol in the Maldives". MainlyMaldives.co.uk. 5 December 2013. Retrieved 7 June 2016. ^ Htoo Thant (14 June 2014). "Govt rejects minimum drinking age". Myanmar Times. Archived from the original on 17 June 2014. Retrieved 7 March 2017. ^ "Drinking Age in North Korea". Retrieved 28 July 2015. ^ "Oman". Foreign and Commonwealth Office. Retrieved 24 September 2016. ^ Article 2 of the Children and Youth Welfare Law (zh:兒童及少年福利法) of the Republic of China, effective since 2003-05-28 in Taiwan Area, defines children and youth as people under the age of 18. ^ a b Patin, Jennifer. "Thailand Tourist Information: A Guide to Laws in Thailand". Thailand Law Forum. Retrieved 2013-01-08. ^ "ต่ำกว่า 20 ปี ไม่ขายสุราให้". Thaihealth.or.th. Retrieved 28 July 2015. ^ a b c "United Arab Emirates travel advice - GOVUK". www.gov.uk. Retrieved 2016-05-26. ^ "International Drinking Guidelines". International Center for Alcohol Policies. Retrieved 2009-02-17. ^ AFP, dpa (26 February 2005). "EU will Alkoholkauf erst ab 18 erlauben". www.rp-online.de (in German). Retrieved 23 March 2018. ^ AFP, dpa (13 March 2007). "Die EU will Alkohol erst ab 18 Jahren freigeben". www.abendblatt.de (in German). Retrieved 23 March 2018. ^ Christoph B. Schiltz (27 April 2015). "EU-Parlament will Alkohol unter 18 verbieten". www.welt.de/politik (in German). Retrieved 23 March 2018. ^ Marlowe (2002-03-07). "La ley seca aprobada en Madrid". elinconformistadigital.com (in Spanish). Archived from the original on 2015-04-08. Retrieved 2015-04-07. ^ "El Conseller Blasco propone aumentar la edad legal para el consumo de alcohol". joves.net (in Spanish). 2002. Archived from the original on 2015-04-14. Retrieved 2015-04-07. ^ "Cataluña eleva hasta los 18 años la edad mínima para poder comprar alcohol". lasdrogas.info (in Spanish). 2002-02-28. Retrieved 2015-04-07. ^ "Forbud mod salg af alkohol til personer under 16 år – virker det?". si-folkesundhed.dk (in Danish). Jørgensen MH, Riegels M, Hesse U & Grønbæk M. 2006. p. København: Statens Institut for Folkesundhed. Retrieved 2015-04-07. ^ "Lebensmittel- und Gebrauchsgegenständeverordnung - Art. 11". admin.ch (in German). The Federal Authorities of the Swiss Confederation. Retrieved 2015-04-07. ^ "Bundesgesetz über die gebrannten Wasser - Art. 41". admin.ch (in German). The Federal Authorities of the Swiss Confederation. Retrieved 2015-04-07. ^ "Legge sulla promozione della salute e il coordinamento sanitario (Legge sanitaria) - Art. 51". ti.ch (in Italian). Retrieved 2015-04-07. ^ "La legislación contra el botellón en manos de las comunidades autónomas". ElConfidencial.com (in Spanish). 2012. Retrieved 2015-04-07. ^ "Children and Young Persons (Alcohol, Tobacco and Gaming) Act 2006" (PDF). gibraltarlaws.gov.gi. Government of Gibraltar. 2006. Retrieved 2015-04-07. ^ Bastien Hugues (2009-03-09). "La vente d'alcool et de tabac interdite aux mineurs". lefigaro.fr (in French). Retrieved 2015-04-07. ^ Mark (2014-06-16). "Legal Drinking Age". livinginmalta.com. Retrieved 2015-04-07. ^ Santiago de Compostela (2010-06-17). "Galicia elevará de 16 a 18 años la edad para beber y multará la venta a menores". elmundo.es (in Spanish). Retrieved 2015-04-07. ^ "Lovgivning på alkoholområdet". sundhedsstyrelsen.dk (in Danish). Sundhedsstyrelsen. 2014-01-22. Retrieved 2015-04-07. ^ "Divieto di vendita alcolici ai minori di anni 18". ufficiocommercio.it (in Italian). Ufficio Commercio. 2012-11-14. Retrieved 2015-04-07. ^ Instituto da Vinha e do Vinho (2013-03-27). "RESTRIÇÕES À DISPONIBILIZAÇÃO, VENDA E CONSUMO DE BEBIDAS ALCOÓLICAS - N.º02/2013" (PDF). ivv.min-agricultura.pt (in Portuguese). Archived from the original (PDF) on 2013-11-07. Retrieved 2015-04-07. ^ "Alcohol in de wet". rijksoverheid.nl (in Dutch). Retrieved 7 April 2015. ^ "Las copas saldrán caras a los menores". lne.es (in Spanish). 2015-03-06. Retrieved 2015-04-07. ^ a b c "Seimas adopted amendments on reduction of alcohol consumption". Parliament of Lithuania (lrs.lt). Retrieved 2017-06-01. ^ a b c "ՎԱՐՉԱԿԱՆ ԻՐԱՎԱԽԱԽՏՈՒՄՆԵՐԻ ՎԵՐԱԲԵՐՅԱԼ ՀԱՅԱՍՏԱՆԻ ՀԱՆՐԱՊԵՏՈՒԹՅԱՆ ՕՐԵՆՍԳԻՐՔ ԳԼՈՒԽ 19. - Հոդված 329. - 16., 17". National Assembly. Retrieved 22 March 2018. ^ a b c "Sosium – Siqaret qadağası gündəmdə". bakupost.az. Archived from the original on 3 January 2015. Retrieved 22 March 2018. ^ a b c "МУС Беларусі прапануе забараніць курэнне і ўжыванне алкаголю для асоб, маладзейшых за 18 гадоў". blr.belta.bye. Archived from the original on 28 December 2014. Retrieved 22 March 2018. ^ a b c "Vente et consommation d'alcool en Belgique". jeunesetalcool.be. Archived from the original on 2015-02-18. Retrieved 2014-12-31. ^ a b c "Prodaja alkoholnih pića osobama mlađim od 18 godina". jeunesetalcool.be. Retrieved 2015-01-09. ^ a b c "Деца и юноши под 18 години". konsumirai-otgovorno.bg. Archived from the original on 2014-07-05. Retrieved 2015-01-09. ^ a b c "Strogo zabranjena prodaja alkohola mlađima od 18 godina!". umas.hr/. Archived from the original on 2014-12-24. Retrieved 2015-01-09. ^ a b c ""Πώλησης Οινοπνευματωδών Ποτών" Νόμου (Κεφ. 144)". businessincyprus.gov.cy. Archived from the original on 2014-12-14. Retrieved 2015-01-09. ^ "Archived copy" (PDF). Archived from the original (PDF) on 2014-08-08. Retrieved 2015-01-10. CS1 maint: Archived copy as title (link) Collection of Laws of the Czech Criminal Code (Czech Republic). 379/2005 Sb. ZÁKON - ČÁST PRVNÍ Ochrana před škodami působenými tabákovými výrobky, alkoholem ajinými návykovými látkami § 11, § 12, § 14, § 15: Omezení prodeje a dovozu. Retrieved on 20. October 2014. ^ "379/2005 Sb. - o opatřeních k ochraně před škodami působenými tabákovými výrobky, alkoholem a jinými návykovými látkami a o změně souvisejících zákonů - Text předpisu - Portál veřejné správy". Retrieved 28 July 2015. ^ "Trestní zákoník (zákon č. 40/2009 Sb.) §204". ^ "Trestní zákoník (zákon č. 40/2009 Sb.) §201". ^ Lenka Krbcová (23 September 2010). "Policie: "Máme vaše dítě. Pilo."". Vitalia.cz. Retrieved 28 July 2015. ^ AF Cecilie Lund Kristiansen. "Butikker har styr på nye alkohol-regler" (in Danish). Politiken.dk. Archived from the original on 2012-10-07. Retrieved 2012-08-11. ^ "Alcohol culture in Denmark". Alcoholcultureindenmark.webbyen.dk. Retrieved 2009-06-20. ^ "Lov om forbud mod salg af tobak og alkohol til personer under 16 år" (in Danish). Retrieved 2013-01-08. ^ "Alkoholiseadus". Retrieved 28 July 2015. ^ a b c "Alkoholilaki 1143/1994 - Ajantasainen lainsäädäntö - FINLEX ®". Retrieved 28 July 2015. ^ "If you look under 30, get your ID out". YLE News. 2012-10-12. Retrieved 2013-04-21. ^ "Laki rikesakkorikkomuksista 756/2010 - Ajantasainen lainsäädäntö - FINLEX ®". Retrieved 28 July 2015. ^ a b "Code de la santé publique - Article L3353-3 - Legifrance". Retrieved 28 July 2015. ^ "Code de la santé publique - Article L3342-1 - Legifrance". Retrieved 28 July 2015. ^ Law passed on 23 July 2009. ^ French Public Health Code, Art L3353-4. ^ a b c გაფრთხილება. 31 October 2008. Retrieved 22 March 2018. ^ Protection of Young Persons Act, Amendment by Article 3, Act (PDF). 31 October 2008. Retrieved 13 July 2017. ^ a b c Children and Young Persons (Alcohol, Tobacco, and Gaming) Act 2006 (Gibraltar Laws). ^ a b c "Protection of minors ΦΕΚ A 262/2008". www.nt.gr National Printing Office. 2008-12-23. ^ https://www.althingi.is/altext/stjt/1998.075.html "Alcohol Act", Parliamentary Document 1558, 122. Legislative Assembly 478. Act: Alcohol Act (Total Law ). Act no. 75, 15 June 1998. ^ a b "At what age can I?". www.citizensinformation.ie. Retrieved 2017-02-28. ^ "Alcohol and the law". Citizensinformation.ie. 2012-03-07. Retrieved 2012-08-11. ^ a b c Istituto Poligrafico e Zecca dello Stato S.p.A. "Trova Norme & Concorsi - Normativa Sanitaria". Retrieved 28 July 2015. ^ "Vietata la vendita di alcolici ai minori di anni 18: emanata la legge". asaps.it. 17 February 2013. Retrieved 2015-01-09. ^ a b c "Alkoholisko dzērienu aprites likums". likumi.lv. May 1, 2004. Retrieved 2015-01-09. ^ a b c "RECUEIL DE LEGISLATION - A –– N° 237 29 décembre 2006". legilux.public.lu. 2006-09-29. Retrieved 2014-06-02. ^ "Legal Drinking Age in Malta - Buying Alcohol from Bars - Malta Blog". Malta.cc. 2009-12-29. Retrieved 2012-08-11. ^ a b c "LEGE Nr. 1100 din 30.06.2000 cu privire la fabricarea şi circulaţia alcoolului etilic şi a producţiei alcoolice - Art. 30". lex.justice.md. 15 October 2010. Retrieved 22 March 2018. ^ "Од март алкохол ќе се продава и по 19 часот". inovativnost.mk. Retrieved 22 March 2018. ^ "Proposition to Odelstinget rejecting the idea of holding minors criminally responsible for the purchase or consumption of alcohol". Regjeringen.no. Retrieved 2009-06-20. ^ "Police: It's okay to drink in public parks". Aftenposten. 2009-07-02. Archived from the original on 2010-05-03. Retrieved 2011-08-02. ^ a b "USTAWA z dnia 26 października 1982 r. o wychowaniu w trzeźwości i przeciwdziałaniu alkoholizmowi. (tekst jednolity: Dz. U. 2002 r. Nr 147 poz. 1231)" (PDF) (in Polish). Retrieved 2014-03-30. ^ "The Act on Upbringing in Sobriety and Counteracting Alcoholism" (PDF). Retrieved 2016-07-10. ^ a b "1 de Julho: nova legislação sobre o álcool e a vacina Prevenar em vigor". Público (in Portuguese). Retrieved 28 July 2015. ^ "Legea nr. 61/1991 (Actualizata 2008), pentru sanctionarea faptelor de incalcare a unor norme de convietuire sociala, a ordinii si linistii publice" (in Romanian). June 2011. Retrieved 2013-01-08. ^ Федеральный закон о государственном регулировании производства и оборота этилового спирта, алкогольной и спиртосодержащей продукции (in Russian). Archived from the original on 2011-08-11. Retrieved 2013-01-08. ^ "Закон о јавном реду и миру, члан 21" (PDF). ^ "Zákon č. 219/1996 Z. z. o ochrane pred zneužívaním alkoholických nápojov a o zriaďovaní a prevádzke protialkoholických záchytných izieb". Retrieved 2016-05-20. ^ "Zákon o ochrane pred zneužívaním alkoholických nápojov a o zriaďovaní a prevádzke protialkoholických záchytných izieb". Retrieved 2015-01-09. ^ "Asturias raises legal drinking age from 16 to 18". ThinkSpain. 8 March 2015. Retrieved 22 June 2016. ^ "Systembolaget - Rules on selling". Systembolaget.se. Archived from the original on 2009-01-16. Retrieved 2009-06-20. ^ "3 Kap. 7§ Alkohollag (2010:1622)". Retrieved 27 June 2018. ^ "817.02 Lebensmittel- und Gebrauchsgegenständeverordnung Art. 11". admin.ch. Retrieved 2015-01-09. ^ "680 Bundesgesetz über die gebrannten Wasser Art. 41 IV. 1. i." admin.ch. Retrieved 2015-01-09. ^ "311.0 Schweizerisches Strafgesetzbuch vom 21. Dezember 1937 (Stand am 1. Januar 2015) - Art. 411" (PDF). admin.ch (in German). Swiss Federal Council. Retrieved 2015-08-09. ^ "680 Bundesgesetz vom 21. Juni 1932 über die gebrannten Wasser (Alkoholgesetz) - Art. 57". admin.ch (in German). Swiss Federal Council. Retrieved 2015-08-09. ^ "RL 942.100 Legge sugli esercizi alberghieri e sulla ristorazione del 1° giugno 2010 (stato 15 giugno 2017) - art. 23 cpv. 1 lit. a". ti.ch (in Italian). Retrieved 2019-03-02. ^ a b c d "Licensing Act 2003 section 150". Retrieved 22 October 2015. ^ a b c "Children and Young Persons Act 1933". Retrieved 28 July 2015. ^ a b "Bringing goods into the UK - 3. Arrivals from outside the EU". gov.uk. Retrieved 17 June 2017. ^ "Alcohol and young people - GOV.UK". www.gov.uk. Retrieved 2015-11-10. ^ "Licensing (Scotland) Act 2005". Retrieved 28 July 2015. ^ "BBPA Home - Industry Briefings - Challenge 21". ^ "ALCOHOL REFORM ISSUES PAPER" (PDF). samoalawreform.gov.ws. Samoa Law Reform Commission. Archived from the original (PDF) on 17 September 2014. Retrieved 25 March 2015. ^ "Alcohol and young people". Victorian State Government, Department of Health, Australia. Archived from the original on 2010-03-04. Retrieved 2013-01-08. ^ "Offence for supplying alcohol to minors". Department of Health Victoria. Retrieved 2013-01-08. ^ a b "State lowers legal drink age - Fiji Times Online". Fijitimes.com. 2009-05-20. Archived from the original on 2014-01-11. Retrieved 2009-06-20. ^ The Drinking Age On Guam Is Now 21, Pacific News Center, July 8, 2010. ^ "Young people and alcohol". communitylaw.org.nz. Archived from the original on 5 April 2016. Retrieved 30 April 2016. ^ "2 Interpretation -- Sale of Liquor Act 1989 No 63 (as at 01 July 2011), Public Act -- New Zealand Legislation Online". Parliamentary Counsel Office. 1 July 2011. Retrieved 2013-01-08. ^ "The law about supply to young people". Alcohol.org.nz. Retrieved 30 April 2016. ^ "H. B. No. 19-141 HDI SSI" (PDF). cnmilaw.org. Retrieved 22 March 2018. ^ a b "Alcoholic Beverage Control Act - § 1068. Sale or distribution to minors; purchase, possession, or consumption by minors". Pacific Islands Legal Information Institute. Retrieved 22 March 2018. ^ "Liquor Act 2011 - Section 14" (PDF). Parliament of Samoa. Retrieved 22 March 2018. ^ a b c d "Section 72 of the Liquor Act (Ch. 144)". Pacific Islands Legal Information Institute. Retrieved 22 March 2018. ^ Crimes, Procedure and Evidence Rules 2003, s50(3). ^ a b "INTOXICATING LIQUOR ACT - Section 65" (PDF). The Kingdom of Tonga, Attorney General's Office. Retrieved 22 March 2018. ^ a b "Liquor Licensing Act - Section 17". Pacific Islands Legal Information Institute. Retrieved 22 March 2018. This page was last edited on 13 April 2019, at 20:12 (UTC).